For those who love books as objects but find themselves staring at screens all day, harboring the dream of a personal book-lined library with comfortable arm chairs and a Citizen Kane-size fireplace, then stepping out of the digital age and into Mr. Morgan's Library and Mr. Morgan's Study in the McKim Building of the Morgan Library and Museum presents the opportunity to indulge the fantasy. Maybe envy is a better word. A classically inspired 1906 building on 36th Street and Madison Avenue, designed by Charles Follen McKim, housed these sumptuous rooms for financier John Pierpont Morgan (1837-1913), and exploring them after their recent restoration is akin to seeing the world anew with a much better pair of prescription eye glasses. The colorful and brightened rooms of the renovated McKim Building now play an even more lovely counterpoint to the airiness and whiteness of the 2006 additions of architect Renzo Piano. Furthermore, an intriguing opened vault off the study and especially a new North Room, one formerly used by the Morgan's librarian, offer yet another excuse to visit a place where rare original manuscripts are treated like prized relics of a medieval kingdom. Mr. Morgan's Library (East Room). Photography by Graham Haber, 2010. 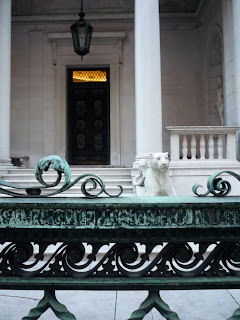 Courtesy The Morgan Library & Museum. Secret doors, zodiac signs on ceiling murals, a life mask of General George Washington, the extraordinary jeweled Lindau Gospel, the latter an inheritance of Charlemagne's empire - all this sounds like something out of a Dan Brown novel, as if J. P. were privy to secrets of the Knights Templar. Yet, while luxurious the surroundings on 36th St. in Murray Hill, Morgan's biblio-extravaganza is not that far different in visual splendor from the great European libraries of past centuries, as evidenced in the large photographs by Massimo Listri on exhibit upstairs in the Morgan Library and Museum. 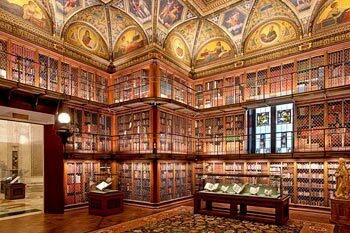 And in the city, the Reading Room of the New York Public Library is arguably an even more dramatic jaw-dropping spectacular, certainly of larger scale, the result of a public-private merger of the Astor and Lenox libraries with Andrew Carnegie's money. Still, for someone's own private library, Mr. Morgan had few peers. He even had his own pair of lion statues, created by NYPL's "Patience” and "Fortitude" sculptor Edward Clark Potter (1857-1923), fronting his Palladian entrance way. Maybe he was in the Illuminati. He certainly exercised power. 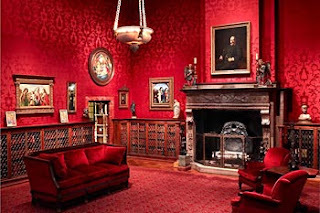 It was in his red study here, even more luminously red and regal following the renovation, that the 70-year-old banking giant concocted the plan to save the financial system of the United States during the Panic of 1907. Mr. Morgan's Study (West Room). The items on display in cases in the refurbished and brightened library include many treasures that should be appreciated in person, as they are all beautiful, singular, and rare, displaying the hands of their creators. Among them - a book of explorations of the Caribbean, ca. 1586, with sublimely drawn discoveries; Alexander Calder's notes for an exhibit at Pierre Matisse Gallery (1941-42); music manuscripts by Bach, Chopin, Debussy, and Schumann (a newly discovered work); manuscripts by various authors (St. Augustine and Mary Shelley, among them); and the most timely for the season, Charles Dickens's original manuscript for A Christmas Carol (1843), turned to the page with the appearance of Marley's ghost. In the age of quick digital transfers of whole books upon a flat screen, the presence and dimensionality of scrapbooks, writing journals, and beautifully made books seem a wonder. How strange that a digital culture would make a visit to a library feel so unreal. Golly, it's like 3D. If anyone could provide an antidote to Morgan's medievalism, it would be American writer Mark Twain. The famous writer, a rock star in his day, had no patience for the love of fictional medieval gallantry. For example, he thought the likes of Sir Walter Scott ruined the American South. The current exhibit, Mark Twain: A Skeptic's Progress, in conjunction with the New York Public Library, includes these thoughts and many more, bringing the writer to life with a right-on democratic spirit. Given the baronial surroundings, Twain has never seemed so subversive. For upcoming exhibitions at the Morgan, consult this updated list of museum exhibitions. Check the museum's website for hours and admission fees. 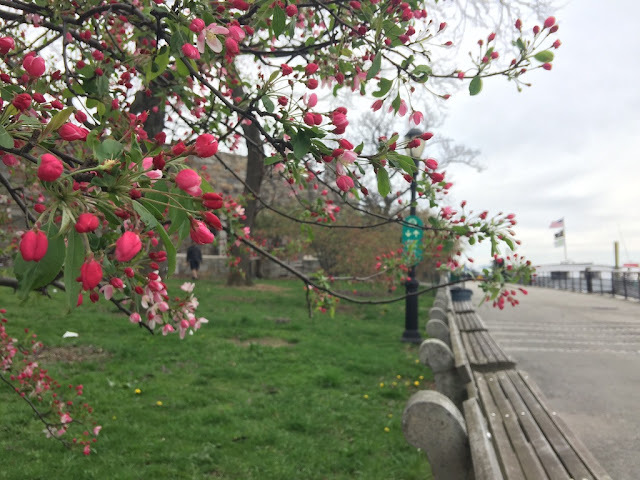 Admission is free on Fridays from 7 p.m. to 9 p.m. Closed Monday. Dining: The museum operates two rooms, the more formal Dining Room and a less formal cafe in the main atrium. 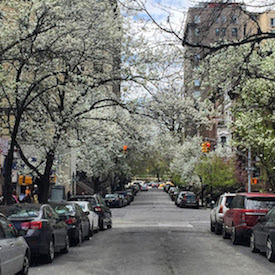 Tip: If lines get too long inside the Morgan, venture up a block and cross the street to Madison Bistro (238 Madison at 37th St.), a charming neighborhood French restaurant with a busy bar and a lovely room for dining. Try the prix fixe or, simply, a warm bowl of their excellent and classic French onion soup accompanied by a basket of good bread. Images of the interior, as noted in captions. Image of the exterior (top) by Walking Off the Big Apple from December 9, 2010.